My new HISSandaROAR library is officially released now and as it consists solely of contact mic recordings I thought I’d share some of the most important aspects of recording with a contact mic that I’ve discovered the hard way – through experience…. 1. WHAT IS IT PLUGGED INTO? “The problem with piezo guitar pickups and contact mics is that they are not well matched to typical audio inputs. By their nature they can generate a lot of signal, but they cannot drive a 50 kilohm typical line input. The pickup needs to work into a much higher impedance, typically 1 megohm or so. The reason why these devices often sound tinny is because the piezo sensor presents its signal through a series capacitance which is small, typically 15nF or less. When wired to a normal 50 kilohm line input this forms a 200Hz high-pass filter, which eliminates the bass. How many times have I seen a piezo element wired up to a 1/4″ jack plug? Many, many times… And now that you know the above tech to be true, what will the results be? Unintentional high pass filter (aka small speaker syndrome) Take anything you’ve ever recorded or listened to, put a HPF on it set to 200HZ and have a second listen…. It suddenly sounds like its coming from a transistor radio from 1973. Great if that is your intention, but otherwise….. The second rule of using a contact mic is more practical, it’s about attaching it. The results are often surprising – sometimes I’ve found a prop (this happened last weekend) and thought: “THIS will sound AMAZING with a contact mic” and then hooked it up & been thoroughly underwhelmed. What seems resonant & complex through the air may well be singular & far less interesting with a contact mic. But its when the reverse is true that things get exciting. My old studio at Ropa Lane in Maupuia was originally owned by a metal company (literally, not the music genre) and when I took the lease they left some huge long I-beams in one of my warehouse spaces. When you lightly tap these 5m long beams they rang like bells, I loved them & couldn’t wait to get my contact mics out. But when I did they were WAY less interesting than through the air. I’m sure I’ll work out the pattern at some stage, but in many ways the mystery is actually a pleasant side effect. Not knowing the outcome means when you do stumble across a beautifully resonant body, time slows down… Recording this library for HISSandaROAR I’ve had many moments where through experimenting I’ve stumbled across a sound, and hours have past before I really became conscious again – I had a sore back for three days because of it. The situation generates what calls someone with a complex name I can’t remember calls ‘flow’ and the only other device that does that for me these days is my modular synth, but thats a different kettle of fish – I now know every time I switch it on, three to five hours will pass! Keep an open mind & explore. A contact mic makes you look at the world in a different way, and for that alone you should be thankful. The flip side to those I-Beams I mentioned, was another prop I bought for practically nothing and hadn’t found a use for, at all – it was a slightly scodey stainless steel shower tray. The trick with it was suspending it so it was free to resonate, and one listen with a contact mic attached would make you wonder WHAT was creating the beautiful musical tones! It sure wasn’t what the literal description makes you think of, thats for sure! Until the drill bit meets the metal surface that the contact mics are attached to, there is no sound. You could hold a contact mic up & scream at it & record nothing! As with the drill that can work to your advantage. You don’t have to worry about extraneous noise – you could be listening to loud music and recording with a contact mic with zero leakage! But it is also a key factor in the use of the sounds – because there is no acoustic to help cue the listener what produced the sound, they appear almost more abstract. But due to their great resonance they work brilliantly as hidden components of complex composite sounds! With experience I collected up various activators (see photo below) and of course, only some activators would work with some resonant bodies… But it gave me a language & a mental model to use when attempting to identify likely candidates, and equally that is invaluable for the imagination. 5. HOW DO YOU ATTACH A CONTACT MIC? I’ll list the models below, just so I can forward this article any such emails in the future! Most of the recordings in the new library were done with two Barcus Berry Planar Wave contact mics combined with & two of their 4000XL preamp. Here is a link to the Barcus Berry product page. I like the 4000 preamps they come with due to them being phantom powered and having a 12dB switchable pad. I could not have cleanly recorded some of the metal shrieks & creaks in the library without that pad! There are many other types of contact mics out there, the first I ever heard of was the C-Ducer but the contact mic element seems a bit big & awkward for my applications… Feel free to comment with any others you have experience with? check out HISSandaROAR CONTACT MIC Library here! Really, I have learned so much reading your blog. Couldn’t agree more!! This blog is really useful and of course this post also. I already bookmarked it and Thank you so much for the wonderful sharing. wow, i just discovered this site through synthtopia, fantastic sounds mate and very useful info re: the 200Hz barrier.. I use contact mics for certain things, but still learned from your article. And the sounds in your library, amazing. Congratulations for this release. Great article and fantastic sounds, Tim! The balloon sounds are fascinating. FYI – Trance Audio are actually still making their Inducer, but it is made to order / custom item only. It took about 8 weeks to ship when I purchased mine last spring. One thing I’ve found with piezos is that a drop of superglue gives a closer connection and better transmission than double sided tape. Obviously this is only relevant if you want a piezo permanently attached to something, but the difference is marked. wouldn’t it be way better for all those sounds if you throw the foam away and let it vibrate freely? sorry, what foam are you referring to? 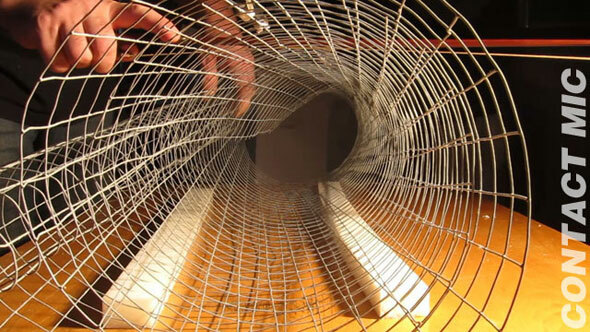 I have used styrofoam to mount metal objects for music… it works wonderfully. The acoustic sound is notably improved… and it provides and excellent surface for a contact mic. You can have multiple objects just sitting on the styrofoam, and the mic pics them up well. The first time I saw this it seemed counterintuitive. I believe the key to the good sound to be due to the lightweight (low-density) nature of the foam structure and slight rigidity of the polymer. But idk. Great article, will be very useful, although it needs some time to digest it all! I think that the complicated name you refer to (“The situation generates what calls someone with a complex name I can’t remember calls ‘flow’…”) is Mihalyi Czikszentmihalyi, and the book is Flow: The Psychology of Optimal Experience (1990). Too fiddly to type; he’s got what you could call a ‘copy & paste’ name. heh heh i bet even >he< has a TextExpander shortcut for typing his own name! Great stuff! I use Silly Putty to stick contact mics to random stuff. 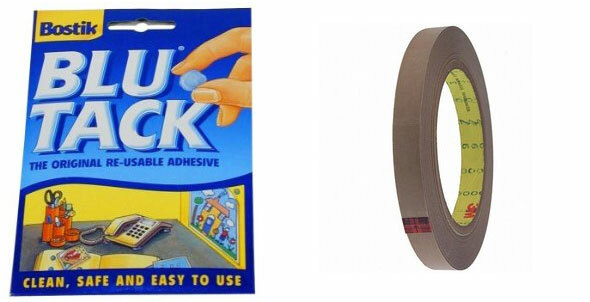 Basically the same thing as Blue Tac. I looked into getting a Barcus Berry but can’t see any in the country and the shop I asked in the US reckon they don’t freight well. There’s always some bit of kit one wishes one had, eh? Thank you Tim! . . . For a cool and informative article ~ I am an electric guitar player.. and I play in stereo, through two amplifiers.. because we have two ears! It’s amazing how much flak I get from recording engineers and soundmen! Marc, are you stereo mic’ing your guitar at the same time? Otherwise, it would be a very different scenario then what Tim’s taking about. I love this article Tim. I’m gonna by few of those mics that you’ve mentioned. I’ve really liked the sound of piezo mics. I can see the difference hugely. Also wanted to say, that what if you’d combine contact mic with the X/Y couple for the acoustic feel if you want to get more of it. Since contact mic sounds dry like this, it would be amazing also for an attack of the sound effect, since it’s picks it up so different from usual mics. Cheers. i think this is who you were referring to when you said “flow”…. and that lecture was PHENOMENAL!! I am having a problem building this “drawdio” device for the purposes of making a pool of water ‘touch-sensitive’ and contact mics are, maybe, a feasible alternative. Which is how i discovered your site. i wanted to see if i could use a contact mic to trigger a video black out using MAX MSP. thank you for reminding me of FLOW. I’d like to use contact mics with my (soon to be delivered) iPhone. Do you know which preamp/devices I should invest in? Great page on contact mics, thanks for all the info. I just found an interesting contact mic that uses piezo-polymer film (PVDF)and also has a built in preamp/buffer circuit. It’s the Measurement Specialties CM-01B contact mic: http://www.meas-spec.com/product/t_product.aspx?id=5431 and it’s only $32. It has a nice freq response and it’s touted as being extremely sensitive. Nobody in the country has these in stock so I’m currently putting together a group buy with a few of my audio geek friends to curb their $25 handling and $35 shipping fees. I should have them within a few weeks from now and I’ll report back here what I think of them for hifi applications. Either way, I thought you might be interested in something that’s a little different from the norm. Thanks Tim for for all the sounds and advice. Do you have any experience with these? I have a Zoom H4n that I’m to be using it with, and got this particular model because it had it’s own preamp so I didn’t have to rely on the H4n pres. Any advice with this type of contact mic and getting a clean signal with my setup would be appreciated!! nice article, i really enjoy reading it. did the mics differ regarding its frequency respond? When I get around to writing a review of the new Trance Audio contact mics I will do a recording using one side of each – the placement creates such huge variance it is otherwise difficult to compare…. didint see your reply, thanks. does the use of xlr on the bb result in greater signal noise ratio? hey there. I’ve been trying to get a watch’s ticking sound with a contact mic into arduino’s analog input. I can get heartbeat, but no luck with watch ticking. Any ideas? What contact mic? What preamp? Do you have a sensitive contact mic and a clean preamp with correct impedance matching? Hi Desmond. I’d like to know how good was the heartbeat you obtained. Were there any impedance issues? Well I have no idea how to do find the required impedance matching or required preamp. Contact mic is sensitive enough I think, because when I connect it to a Marshall amplifier, I can hear the watch ticking quite well. Also is there a way to use Marshall amplifier’s speaker output as my analog input? Compact mic is a piezo mic btw. Forgot to mention. if you read the article above you would appreciate the necessity for a preamp & for impedance matching…. I think you need to do some learning/study about levels & impedance – i know nothing about arduino ie what level does it expect at its analogue input? As the link about impedance matching above states, the output from a contact mic is very small. Thats why you need a preamp. What Marshall amplifier are you talking about? A guitar amp with a speaker output? That is made to drive a speaker impedance…. Arduino accepts 0-5v from its analog input. Yes it’s a small (pocket) guitar amplifier. Sorry about my little knowledge on impedance,levels. But I needed a quick way to solve this problem, although now I see it can not be that quick. I got the sound by salvaging Marshall amplifier’s amplifying circuit and matching its impedance to our Arduino’s analog input by adding high resistances. That was a good improvement on my understanding of impedance over a night. I’m reporting this so it’s helpful for others too. And Tim, thank you for all your help and quick replies. Tim , or who ever els …. Would you be open to trying this with the DAzzo pickup ? It has three walls that hear incoming sound waves in 360 .
associated with low output impedance and preserves the low freqs. I’m a guitarrist,… do you know how to apply all these info to get better sound from my guitar piezo.?? Pingback: Contact Microphone Techniques | . : . : . P a r t i c l e S o u n d s . : . : . Can you suggest a good contact mic for picking up very very quite “sounds”? I am building an automatic safe cracker for a school project and I need something that can “hear” the “tick” when the correct number is dialed in. The nikkei acoustics Contact Mic is ideal for this. Comes with amplifier which has audio filter control. No mention of frequency response on any of the websites? how would / does the best of the two worlds work together (the phantom powered barcus berry 4000 preamp with the better transaudio transducers) ? does the barcus berry pre work well with other piezo bender style mics too? interested in the barcus berry pre, but not as interested in the barcus berry transducers (for the mounting difficulties you have already mentioned). that would be appreciated, looking forward to it. I just wondered what that putty stuff is you use to attach the barcus berrys? Is it just blue tack? does it affect the sound much? Did you read rule #5? Oh dear. I’m very sorry. Thank you for your reply and your patience. Hey, awesome article. I have a Mackie Onyx 1620 board which has 1Mohm input impedance (the guitar buttons) on channels 1 & 2. Do I still need a buffer circuit or can I plug right into the board? Stumbled across a man on kijiji selling a pair and found this page. Can anyone describe results from an acoustic guitar? Hello 🙂 I don’t know english very well, i read what you write up, but i still want to ask you, if i make a contact mic, and i plug it in to a 2.1 speaker it will have good sound?? or if i connect it to a pc..
it depends – what contact mic? what preamp? what prop? I’ve contacted Trance Audio and indeed they do still make them. There is quite a price difference. I’m trying to determine which of the two to buy. You say you prefer the Trance Audio mic capsule more than the Barcus Berry. Why is that? Any other arguments towards one or the other if you could only do one? Thanks for the quick reply. A two part question now. What about the Trance Audio mic with the Barcus Berry pre? Could you mix them? If you could would you prefer the Trance Audio mic? Better specs? Also I have a nice pre that I like. I’m assuming I could use it with the Barcus Berry mic or Trance Audio mic too if the above is possible. My pre is a portable single 9 volt pre from the Sound Professionals that uses 9volt DC bias power. Thanks again for your time. I love your sound library. I do occasional film and commercial work. How does the licensing work with your sounds. Using TA mic element into BB preamp doesnt work well at all, unfortunately. And same vice versa.. I can only presume these preamps are very tightly matched to the mic element. When an individual or facility buys my libraries they are buying a license to use them, with specific parameters & restrictions (eg cant be resold etc etc) – of course an individual license is quite different to a site license. Great article. I love the heading: You dont know anything. This could apply to all of life eh? With either the Trance Audio or Barcus Berry system you could generate bass that would make a sound system shake the foundations of a building! One consideration is powering – the TA uses 2x9V batteries whereas the BB uses phantom power which may not be available to you when using a bass amp…. Fantastic article! The best I have seen on the subject. We manufacture The Cortado, a Balanced Output Piezo contact mic, and soon, a phantom power module to accompany it. We saw the need for an affordable contact mic with a strong, clean, quiet balanced output that is impedance-matched to the recording device, eliminating the preamp. Again, great article! Great sounds. Thanks – please let me know when its available? the Cortado is available now, as a kit or ready to use, but it has been selling better than expected and we expect to stock out around October 20. It should be back in stock by the end of October. The Espresso portable phantom power supply should be released by the end of the year, maybe by Christmas. Both come as kits or ready to use, both are cheap. I’ve bought a couple of your Cortado mics with the Espresso phantom power kits and they are fantastic. Would totally recommend. Your article has enlightened me quite a bit. I’ve been trying to come up with ways to listen to my watch tick as my hobby is watch making and repair. I can buy the equipment to perform what I need to do but thats not as much fun. I have come up with some ways to actually hear the tick that I otherwise could hear only by positioning the watch to my ear. Now all of this has me thinking thanks to your enlightenment. Could Behringer ULTRA-DI DI100 be the solution for the unwanted high-pass filter with line or mic input? I don’t know – is its impedance matched to a piezo element? It seems so but I don’t understand very well. I will give it a try! I have a uni project for in a couple of weeks, I have decided to make tubular bells which have Piezo transducers inside the tubes. My lecturer has recommended i use resisters between the transducer and the output lead. Have anyone got any links or recommendations of a idea resister to use? you need to match impedance – did you look at that simple circuit I linked to? How would you characterize performance specifications for contact mics? For all other mics, we have a standard medium through which the audio information is transmitted to the mic (the atmosphere). With contact mics, there is no transmission medium. The performance of the mic is dependent upon the object to which it is stuck. I see little information on the subject online. One fellow suggested sticking the mic directly to a hifi driver and feeding a sine sweep signal to the speaker as a reference, and analyzing the signal picked up by the mic. What do you think? 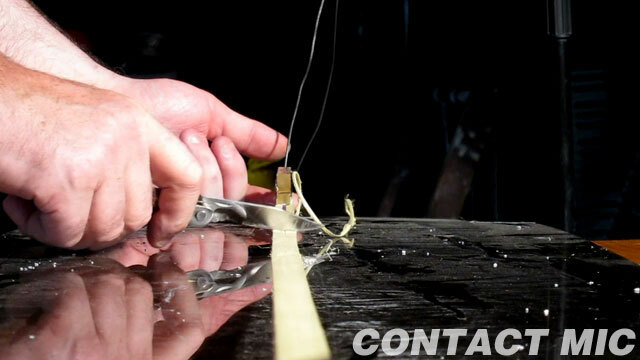 “With contact mics, there is no transmission medium” – thats not correct, there is a transmission medium: its metal, wood, polystyrene, glass, rubber, plastic, perspex or whatever the contact mic is receiving the source of the vibration through. Wow, thanks so much for this guide! I’m piecing together all the bits I need to record some original impacts, scrapes, booms, etc. and this is invaluable! So I was comparing the impedance of the BB pre-amp to what’s typically found in most audio interfaces with a hi-z setting and it seems like this might be sufficient? The Steinberg UR-44 has two hi-z inputs that run at 1 mega ohm, so do you think they’d work for the “stereo” contact recording , and use the two remaining mic inputs for a dynamic and condenser for a close mic sound? Is there any risk of me damaging the pre-amps in my soundcard with contact mics? And just one other question – I’m seeing a lot of mics online marketed as being for mandolins, violins, etc. Are these essentially the same as what you’re using? Contact mics made for specific instruments are made for specific instruments – so think about the frequency range of a mandolin or violin and then think about the frequency range of a double bass, or piano. They are not the same right? & sorry but I have no idea about any Steinberg preamps – I’ve never used them & don’t know anything about them. The contact mics I use are matched to the preamps, and I imagine its more than just impedance. If I was making them I would analyse the impedance & frequency response of the contact mic element and then build a preamp accordingly. Thank you for the swift reply Tim! Oh yeah I get that – I just wondered if maybe they were labelling them as such as that’s the most common use, but if they’re actually purpose built for those instruments I’ll give them a miss and look for something with a wider response. Yeah I mean the Steinberg stuff, obviously, is suited for conventional music making. I guess my worry was that I could push its pre-amps past their limit and end up trashing a perfectly good interface! I’ll do a little more research then. I’m checking out some of the links to mics and hardware that your other readers have left so maybe I’ll find something there. Cheers anyway! Great post… and impressive blog in it’s entirety… thanks! I’m an audio student, looking at using some contact mics and hydrophones as part of a major project for my degree. Obviously studying full-time has it’s financial constraints, so I am planning on making use of my existing DR-60mkII recorder and try to balance the quality vs expense on the mics. Any other economical suggestions welcome. Thanks for replying Tim. 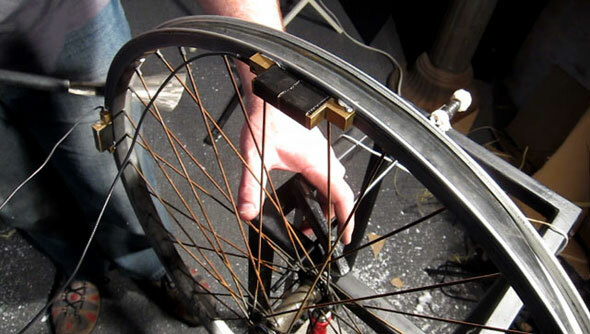 I have had good results with the typical disk piezos using a Tech 21 Para Driver DI (SansAmp). Certainly not as matched as one of your preferred options, but a good place to start given the relatively now cost. This thread seems somewhat active so hopefully I can contribute AND have a question answered! I’m interested in using contact mic technology on percussion and have recently been reading up on Zildjian’s Gen16 line of hybrid cymbals. It uses a sensor that Zildjian only refers to as a “vibrational transducer” that is connected to their proprietary preamp. I think Zildjian is being somewhat coy with their description as not to fully broadcast the inner workings of their product. But, I’d like to potentially use only the sensor for some unconventional applications and knowing the general technology the sensor is built on would help. Any speculation on what the sensor technology generally is? I would assume it’s essentially piezo, but I don’t know enough about the engineering of transducers to know whether there are other types of transducer technologies other than piezo. Here’s some links to the product! I wish to enter the world of natural/material sound experiments and I wonder what are the benefits of using contact mics over cardioid condenser mics to record them. I did read the article and haven’t found the answers I was looking for. I’ll try to do a comparison on different materials/settings with both my Gefell cardio. and the Barcus Berry I’ll hopefully be receiving in a month or so. so the section on “THERE IS NO ACOUSTIC” had no meaning to you? Why are we debating on the quality of your post ? I already said I thought it was great. I guess I was just looking for additional experience sharing on the matter, that’s all. It is very interesting for me, if a contact microphone or accelerometer can be used as noise/noise pollution sensor mounted inside relatively small metal box mounted over the street. Metal box should act as a resonator, I guess. Thank you very much for great article, Tim! Would you be so kind to tell, do you use any kind of post-production? (i mean noise reduction maybe … or some eq correction) Or basically, you leave recorded material “as is”? Thank you. I am fascinated by your knowledge and experience. I am a musician that recently lost all of my hearing in my left ear. I will soon be at the point of decision to have a bone anchored hearing implant. Through research I have found that these devices are small and have a low limit of around 400hz up to around 8000khz. I have tried several of the bone conduction headsets on the market such as Aftershokz, They sound tinny and lack bass, just as you mentioned. There is much on the web for building your own bone conducting headphones using piezoelectric transducers from radio shack and other sources. So I have been thinking about what it would take to make a small piezo capable of a greater frequency range. Do you have any ideas on the subject? It might be worth researching the deaf percussionist Evelyn Glennie as I would suspect you will still feel (and even more so possibly) low freq eg under 200Hz through resonance in your body… The hard part will be losing accuracy in hearing the fundamental freq when hearing and playing music, but a lot of great music was recorded and produced in mono, so hopefully tour other ear is ok? I use an acoustic guitar simulator pedal in between my piezo classical guitar jack n my guitar amplifier, using the pedal as a pre-amp. Then I have got real good classical guitar tones. Tim: Did you ever get a chance to try and review the Cortado that is mentioned above in communications? Some times ago i saw a video of contact mic performance (kind of electroacoustic improvisation) and guy touched mic by fingers and even took mic itself in hand and moved it on the table surface … i’ve tried do to the same and faced with problem of very spiky transients popping out. Have you ever tried this technique and if so how you deal with possibly spiky sounds (usually in high/high mid area)? I know that when i use (for example) cardioid condenser mic i can move mic a little bit away from the source and it helps to take smooth recordings without being spiky … but contact mic – it’ another story. Yes, i can move contact mic away from the source and sometimes it helps also (but a recorded sound a bit muffled in comparison with sound recorded much closer to contact mic) What when i want to use performance technique when i hold contact mic in my hand and possibly moving it across some surface? How to tame high freq transients? Do you have any experience with it? Wouldn’t have a clue sorry… I would never hold a contact mic in my hand while recording – it needs good strong direct contact with the resonating body, I don’t see how holding it in your hand is going to help that? Today i’m trying to connect main output of my Barcus Berry 4000 XL preamp into Line In of Avid HD Omni interface – but no luck 🙁 I can’t hear any incoming signal … The only sound i hear is when i connect Barcus main output into mic or instrument input of HD Omni – but in this case i have two preamps connected one into another (Barcus preamp —-> HD Omni preamp) thus i have more noise. Strange, but why i can’t hear any incoming if connect in Line In – it’s ordinary thing to put preamp in line input. If it’s not a big secret, how do you connect your Barcus into interface (or portable recorder maybe)? p.s. 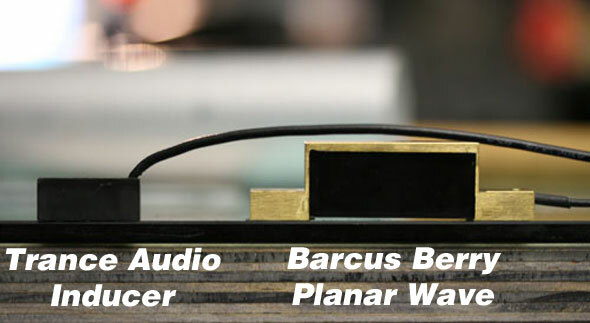 : as i understand, second output of Barcus (named Monitor out) is for headphones? Hmm … but BB also has it’s own battery inside so it can operate without 48V phantom. Hi, hopefully you can guide me in the right direction. I need a module that will use incoming piezo mic voltages (from tap dancing on a mic’d surface) to create various pitched notes. I don’t know whether a piezo-voltage to MIDI converter exists, or a synth module that can take the incoming piezo-voltages and use them to generate various pitched notes… do you have any suggestions, ideas of where I can look, what I might use? Its not ‘piezo voltage’ – it is sound. So you want something to analyse sound for its pitch content, and output MIDI. I sincerely doubt there is hardware existing that can do this but I wouldn’t have a clue as have never wanted to do it…. but it sounds like something Max could be programmed to achieve. I’m Anna. I read seen your blog today and I think you have a lot of awesome articles. Moreover, your site content holds quite a similarity with my blog. For that reason, I’m interested in connecting with your site through native ways, in the form of content. Do you accept sponsored posts? I look forward to hearing from you soon and wish you much success in your endeavors. Hi, Tim. Very grateful for your knowledge and expertise! I’m writing a new piece for the the Australian harpist, Alice Giles, which will be performed outdoors with some live eolian harp sound mixed in. The eolian harps are at at some distance from the performance stage. Is there such a thing as a wireless contact mike? (the more wind, the better the eolian sound . . . and the more direct wind sound interference there is with a standard mic) Any suggestions much appreciated. I’m thinking of securing a contact mic piezo/trigger to a drum head by sandwiching it between two strong neodymium magnets. Would magnets affect the voltage/signal at all or adversely? Would it require any special shielding maybe? Thanks for your input. I have been using contact microphone in sports for over 20 years. Check out a small sporting event in South Korea. There are contacts from Audio Technica in the Ice at Figure Skating. Hi Tim. Thank you for your insightful informations. I want to ask if it is possible for piezo to pick up a person’s voice in a good quality. I tried doing it, but the voice sounds very dull (like a telephone from 30years ago) and is different from my actual voice. Is there another type of contact microphone/transducer that could do this? Also, as much as I like how piezo could pick up little sounds details, it annoys when I touch piezo by accident and makes unnecessary sounds. Is there a material that I could put on part of piezo and would block the sound when I touch piezo/surroundings by accident? Your suggestions would be very appreciated. Contact mic picks up vibrations – a good way to test a possible location is to lightly put your finger on it & if you can feel vibrations then put the mic there. Therefore for voice I guess you could try sticking it to your throat or voice box. I read a local singer used to put a contact mic between her teeth ie clench/bite it… But I would not expect to pick up ‘normal’ voice sound this way, as part of what gives a voice its character is the size of throat, chest, voice box etc… whereas contact mic picks up just the close resonance/vibrations… But experiment! I have no idea for material to isolate sound from contact mic – anything is going to transfer the vibrations from you touching it, you just need to be careful with placement of contact mic and the cable, as the cable can also transfer unwanted noise to the mic. Hi Tim and thanks a lot for your article, I’ve learned a lot from it and from the subsequent comments! Maybe even get power from phantom? Great article. I’ve read it several times! You say they still make the mono version of the Inducer system — is that still so, even today, years later? Sound travels 4.3 times faster in water than air , ithis is why I could “hear ” or more correctly feel sound a long time before my ears heard it (I do a lot of metronome practice) sounds funny my feet hear better than my ears , I’ve joined them together . Mine were broke . I’m not yet into mics or synthesis but If you know what I’m talking about , I’m guessing using pure click non acoustic to synthesis with a synth might be interesting. Thank you for this great page! I just tried Blu-tack on the bottom of my Cortado mkII contact mic for the first time. Worked like a charm but now I wonder if you have any tips on removing the blu-tack from the mic when done? A thin layer is stuck like gum to the bottom of the contact mic. Thanks for any insight! Only trying to learn about mics but very pleased to see the experimental contributions in the article videos and the pingback links. I have some lamellophones, all made in Africa with various African tunings. Some Mbiras from including a new Nyunga Nyunga and a Karimba from Zimbabwe,some Likembes from Congo area, and others that I’m trying to find out about. The actuators are forged or recycled flattened steel or iron rods of different types, and the resonators are carved thick or thin hardwood boards or soundboxes. About half have metal buzzers, either wrapped around the tines, or bottle caps etc attached to the soundboard. One has bamboo tines and soundbox. The lamellophones, at least the ones from Zimbabwe, are tuned to produce overtones caused by changes in width and thickness along the length of each tine. I’d like to be able to run them all through my guitar amp and pedals. Don’t want to mess them up though, one is a hundred years old. I have one electric mbira built in Zim. It sounded weak plugged into the guitar amp but sounds OK with a v-twin tube pedal. It’s anything but tinny, it picks up the deeper overtones from the thick hardwood board but the higher metallic sounds don’t come through as well. Can’t hear the bottlecaps at all and they are part of the music. Figured it has a contact mike but don’t know. I saw a mic at cold gold audio with alligator clip soldered to a piezo, that could be clipped to the bridge or tension bar of a lamellophone to pick up the metallic sound. Most of them have a place to attach the alligator clip. I wonder if those are tough enough to survive a lot of swapping between instruments in my home studio ? The resonant body and buzzer sounds are also important. Maybe something like a ceramic mic would work better, but I like that a contact mic would eliminate ambient noise. I thought of using magnetic guitar pickups, two needed for wider ones, but there is very little space for pickups under the tines. Those guitar tuner pickups that clamp to the headstock look rugged but I wonder if they are sensitive enough since they’re not designed for that. I tried placing my ear on the soundboards of several lamellophones tonight to approximate the sound that would be picked up by a contact mic. I was surprised at how loud they all were. Also, if my ear was under the left side of the soundboard then the tines on that side would sound louder. Left side / right side didn’t make a noticeable difference if the instrument has an enclosed sound box instead of a solid board. The ones with bottlecaps all have solid sound boards – listening with an ear in contact with the board made the tines sound much louder but didn’t amplify the buzzers at all. On that instrument the bottlecaps are vibrating in mostly free space as you suggested, otherwise they wouldn’t vibrate. On the other hand, when I checked a sound box instrument with cylindrical metal rattles attached to the tines, between the bridge and tension rod, listening with the ear in contact did seem to amplify the buzzing, more so if my ear was against the top of the box. Double post was unintentional, delete my Oct. 24 post if you like. Off topic, I remember hiking near a railroad track years ago when a sound emanated from the tracks. I put my ear next to the track and heard a loud musical sound. A few minutes later a train appeared in the distance. Being seen messing around at the tracks might attract the wrong type of attention, but the result may be worth it. Thats a good approach, pressing your ear to detect vibrations – I often just use my finger and if I can feel vibrations (even gently) then it is a good candidate for contact mic placement… The more difficult situation can be where there is too much vibration, and it becomes a challenge to reliably attach the contact mic without it either falling off, or dampening the very vibrations trying to capture…. You are right, I contacted and said they don’t have the specs. I will look for the tech specs + company who make them. Thank you! I’ve build several of these preamps and used them with piezo discs and it works fine. Do you offer advertising space/article placement on musicofsound.co.nz? No I don’t. But you already know this as you do not see any ads on this site, right?